The Arctic Co-op is providing reassurance to the community of Iqualuit following a fire that hit that a major grocery store in the town, in Canada’s Nunavut Territory. 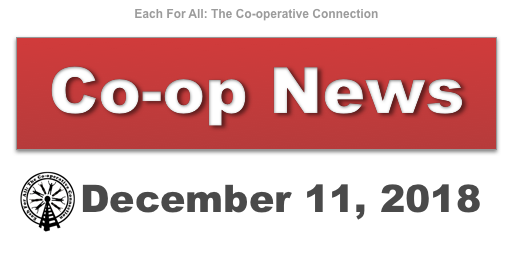 Since the fire, the whole co-op network has been using its collective capacity for procurement, logistics and staffing to ensure that the needs of residents in Iqaluit are being met. 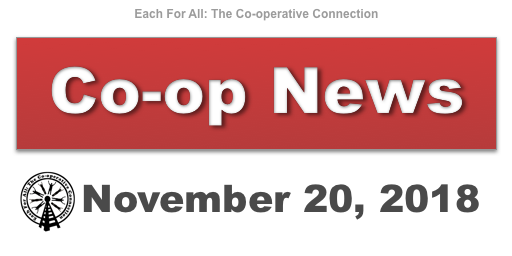 On behalf of the entire co-op system, the Arctic Co-op wanted to communicate its personal assurance and commitment that it will not be taking advantage of the change in the local competitive landscape in its pricing. When the 10 turbines started rotating at the Gunn’s Hill Wind Farm in Ontario, they brought more than just green energy to Oxford County – they brought in revenue. Gunn’s Hill – owned by the Oxford Community Energy Cooperative, the Six Nations of the Grand River and developer Prowind Canada – is Ontario’s first community-sponsored wind farm and Canada’s first wind initiative to include both co-op and Indigenous ownership. Gunn’s Hill, which produces 18 megawatts or enough energy to power 6,700 local homes, is one of a small but growing number of community-owned renewable energy projects either operating or under development across Canada. Examples include the 60 kW Nelson Community Solar Garden outside of Nelson, British Columbia, which describes itself as Canada’s first community solar garden. It’ll dance. It’ll pose for selfies. It’ll even strike up a conversation if you get within a metre. Pepper, a humanoid robot, is the newest employee at Manitoba’s Sunova Credit Union. The credit union says the robot will help enhance the customer experience. Right now, Pepper is mainly a greeter. So it attracts people as they’re walking by. It tells them a bit of an enticing message to stop by, and the robot then tells stories and answer questions that the credit union has set about Sunova. Sunova hopes Pepper will be an ice-breaker with customers. It has big eyes, a little face, arms and legs, and is white, like a slimmed down snowman. But it’s not going to replace any jobs. The robots can be programmed for a variety of functions, such as giving out bank statements.